Once our staff educates them on the characteristics of marble, such as its softness and tendency to scratch, stain and etch, the majority of interested homeowners choose to walk away even though marble was their number one choice! Whether building or remodeling your home, granite, marble, soapstone, travertine and quartzite can reflect your distinctive tastes and individual lifestyle. Pros and Cons of Engineered Quartz. 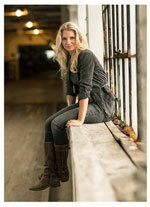 Design Tactics that Reduce Anxiety + Midwest Book Tour by Susie Frasier, Mont Brand Ambassador. Recently I read a statement from the Statistic Brain Research Institute that over 70% of Americans regularly experience physical and psychological symptoms caused by stress. Combine that knowledge with the latest research in neuroarchitecture, which tells us our overall well-being is directly affected by the design features in our living spaces, and we now have an incredible opportunity to heal ourselves right through our homes. A few weeks ago, I presented my belief that a state of well-being doesn’t just come from the healthy food we eat and the physical exercise we provide our bodies. It comes from a deliberate curating of the elements in our homes so our mental condition is nurtured. This type of “Reflective Design” approach can have real impact on our lives especially when we integrate visual patterns from nature directly into our spaces. Every decorative decision we make in our homes directly influences our mental health. Much like our food choices affect our physical bodies, the interior design elements within our built environments impact our emotional minds. Yet all too often in our western culture, we find ourselves placing more emphasis on how something looks than how it makes us feel, and then we wonder why we’re still anxious. 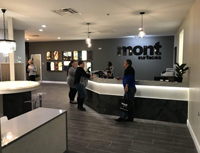 Mont Surfaces, one of the largest suppliers of fine surface materials in the Midwest, and Susie Frazier, a highly recognized Cleveland artist and designer of Earthminded Style®, today announced a new strategic partnership. Working with Fortune 500 and best-in-class companies, Susie has designed custom products for global dignitaries, conference attendees, and corporate clients applying the organic industrial aesthetic for which she’s known. 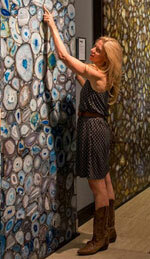 By studying repeating patterns found within various ecosystems, Susie has developed an artistic style that focuses on the natural order of life. Inspired by swarm behavior in animals, botanical decay, and even molecular structures, she illustrates visual compositions that calm the mind by creating order out of chaos. In 1997, Susie became the first designer in America to develop a line of home accessories using cast-off materials from the construction industry. Susie Frazier is a pioneering designer of Earthminded Style®, a way of life that connects people to nature, using sustainable materials for personal empowerment. Susie blends organic sensibilities with natural and industrial discards to create biophilic design solutions that aren’t currently offered in the market. Her distinctive products, textural fine art, original photographs and digitally-illustrated patterns have influenced audiences across the U.S.